okay - i spoke about BG originals briefly this fall, but then stayed so crazy busy with BG Get Your Fall On that i didn't have much time or energy to put towards it. so....now that i have no spring/summer line and my creative manic-mind has been working in over-drive i have decided to re-visit them again. what, might you ask IS a BG original? well, here we go. BG original: o·rig·i·nal, (uh-rij-uh-nl) - noun, proper - a BG original is an article of clothing that is created start to finish by the hands of amy norris and her team of sewing machines. a BG original stems from an idea that has come to mind, and may or may not be the only one in existence. 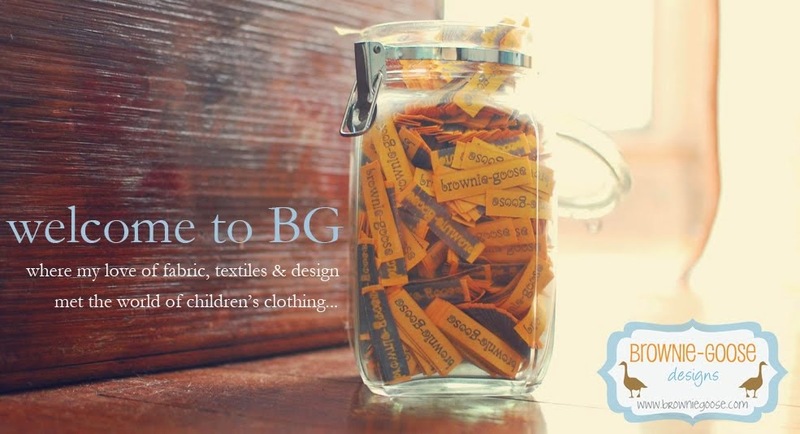 BG originals take time and effort in construction as they are very detail-oriented and therefore cost more than the usual article of BG clothing and also will not be found on most lines due to the amount of time consumption. with that said - as i create BG originals, i will price them accordingly and place them for sale in my etsy store. here is that link. http://www.etsy.com/shop/browniegoose. these articles are in limited quantity and are made in sizes that just pop out to me at the moment. i try hard not to make them louisa's size so that i can actually give them away...but that is not always the case. i personally didn't think the Adeline could get any more feminine, but methinks it did. also, this ruffler pant has been haunting my brain for about a year now, and i am SO happy to finally see it on fabric and i think i lovey! it is just a fun spin off the old-famous BG denim ruffler. likey? want this? watch my etsy store. it is a 2T and was NOT supposed to fit my child the way it did. i must list today, or else i won't get rid of. hehe. okay, had such an amazing response to the clementines when i put them up for auction that it knocked my socks off! awesomeness girls. with that said - i think what the future of clementine will hold is that when i am feeling up to it, i may whip a few out. she will be a spur of the moment thing to keep my sweet little BG girls with BFFs. so - on to what to do for the 8 that are done. 4 of these little girls will be put on etsy (browniegoose.etsy.com) for out-right purchase. now, i am brand-spanking-new to the whole seller side of etsy. never done it before...so everyone bare with me. i wish i could say i was not a proficient etsy buyer - but my paypal account shows other-wise. that place is just so awesome. but, i know that i do have some customers that are not on facebook and so this would allow them to have access to them as well. 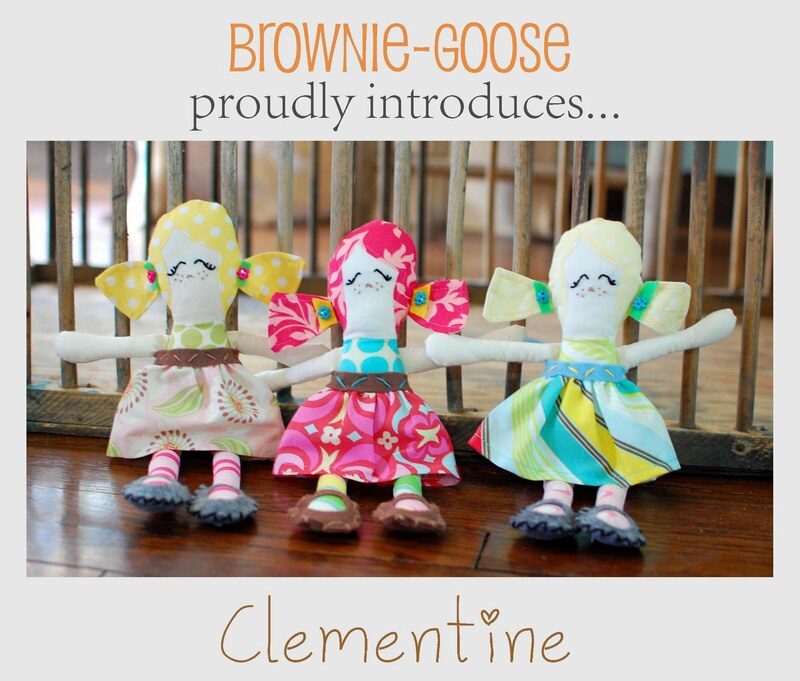 so, the etsy clementines will be listed TONIGHT, meaning saturday night january the 15th. maybe around 7'ish??? for the other 4, i will be putting them on facebook at a set price and will leave comments open until tomorrow night at 7 pm. so - comment on the doll that you would want, i will then at 7 pm go to my old-buddy random.org and pick 4 different numbers. so, if your comment coincides with the number that is picked - you get a clementine. wahoo! now for pricing. i have been 1-800-scrugglin' on how to price these things. i mean, it has been difficult. so much of my time is put into each and every one that i cannot just let them go. i have a very hard time finding other cloth dolls that are comparable to get an idea of where to set price since they vary from $16 all the way to over $100 on etsy. so, at first i decided to pull out my elementary school math and add up all the bids from the auctions and find the means and medians and see where that landed me. well - it landed me at a price range between $48 and $56 and debated on this for quite some time. then, i sat down and figured out how long it took me to finish a doll from start to finish and added in my regular 'seamstress hourly' of $20 per hour to see where that got me without materials. but, then the old realtor in me came back (she was not all that great to start with, hence why i no longer sell real estate) and really wanted to be able to have comparisons. so - with that said...for now i have come to price her at $38. for the dolls out there on the market - this is where i found the most similar to my dear clementines. enough talk - now for getting those things up on the web for all to see, comment and hopefully win the lottery!!!! and i am back my dearies. as i said...idle time is not my friend. but, with that said...this is not the beginning of a huge new production line. i decided from now on that brownie-goose will be supply when i can, not supply from demand. i think i might can balance things out a bit more that way. when i came up with BG Get Your Fall On, i touched bases with the vintage side and have been in love ever since. retro and nostalgia have really peaked for me in my styling, sewing and thinking and when i was at a birthday party and a friend brought a little hand-sewn dolly to give to the birthday girl, i almost wet my pants. i had, and i mean HAD to have one. but then, i decided that i needed to make one. i wanted one with my own spin on it. and with that, clementine was born. meet her. doesn't she give you warm fuzzies? she does to me. i love her. clementines will not be mass produced. i repeat, clementines will not be mass produced. in fact, each and every clementine is hand-sewn completely by me. i use the machine to attach her hair and her dress hem, but other than that...she is created by my own two hands. she is very detail-oriented and even has her own number of authenticity sewn onto her back. i have a record of who has what number, and i intend on keeping it this way. this makes her more special to me and to BG. i am still not sure where to price her be completely honest. i have not been able to find comparables to set pricing. she is time-consuming, and much of that is due to each detail, from her hand-embroidered freckles down to her hand-sewn felt shoes.